Let me introduce to you Kim. I’ve met her, but I don’t know her. But, I think I’m pretty safe to say that she has been learning that the adoption process is a two-way street, that the deep and scary and hard places that she is traveling are helping her guide and navigate and enter into the deep and scary and hard places her children have traveled. And are traveling. And will travel. She is naming what can be really hard for all of us to name – that we All struggle with fear and disconnection and protective layers and vulnerability. But then…what happens when love is offered, when love is received. Meeting my son was nothing like I thought it would be. When my husband and I first arrived in Uganda on a hot, humid night in February, I felt like I was playing out the scenes from a movie. It looked every bit like I imagined during the family day videos. We stood in a too-long line to get our visitor visas while I restrained myself from yelling to everyone ahead of us that our son was on the other side of those doors over there and could we please just go first. We practically ran to baggage claim where our suitcases were waiting (all of them! In Africa! After 20 hours of travel! I should have taken that as my miracle right there). Then, we started the short, shaky 50-foot walk to the doors where we saw the crowd of people waiting for arrivals. We knew our son was in that crowd, with his foster parents, waiting for us. Are you starting to tear up? My main emotion? Fear. Heart pounding through my shirt, breath shallow, sweating, crazy fear. Then my fears multiplied when I finally held our son for the first time and felt… nothing. Well, that’s not exactly true. I felt disoriented. I felt odd, like I wasn’t in the right place. I felt too close to the moment, because it couldn’t be happening to me. Standing in the suffocating Ugandan humidity, I looked in his face, a moment I’d imagined so many times, and searched my heart in vain for the feeling I was sure would come: Where was the love-at-first-sight? The heavens didn’t open. I didn’t feel a warmth or a light and I didn’t hear a small voice inside saying, “yes, this is my son.” It wasn’t magical. I couldn’t hear the soundtrack. I was looking into the face of a child I didn’t know, and he was looking at me like the stranger I was to him. I remember a desperate feeling, trying to conjure tears, emotion, relief, anything, trying to feel what I was supposed to be feeling, according to all the videos. Instead, I felt blank and empty, and in that void of emotion, fear rushed in like a tsunami. I was drowning. This was the moment I was waiting for? It wasn’t because my son wasn’t all I thought he would be. He was cuter than the pictures, he was sweet and soft and innocent and bewildered. He was everything. It was me. It was my heart and its hardness that surprised me. I was closed off somehow, unable to open my heart up and love the way I wanted to. But here’s the truth that I learned over the next year: As their parents, we show our children the way to vulnerability. When their hearts are wounded deep from broken connections to birth parents, birth culture, orphanage nannies or foster parents, they’re caught deep in their own fortresses, built up so quickly in their short lives to guard against another heart-deep wound. And as their adoptive parents, we don’t come storming in to destroy those protections. We open our hearts and bleed for them. We explore our own woundedness so we understand a small taste of theirs. We painfully unlearn the blueprints we’ve imprinted from our own broken childhoods. We look into the face of Jesus, the one who shows us unconditional love as we struggle and fail and fall down over and over. And then we show our children that they can’t do anything to lose our love. They fire attacks as if at an enemy, trying every weapon in their arsenal to make us retreat like every other caregiver they’ve loved has retreated. Some days you feel like retreating into your own bunker, of building up your invulnerability again, putting up your walls. Other days you’d like the surface satisfaction of firing back, trying to take their stronghold by force. But is that what Jesus would do? Is that what he did to win you over? No; Jesus calls us to follow his lead, to walk his path. This means that in every relationship, we lay down our lives for those we’re called to love. When the attacks come fast and furious from our little fortress-child, we open our arms and absorb the blows. When they rail against us, testing a belief learned deep in their bones, sometimes beyond memory, that no love lasts forever, we open our hearts again and again and again, learning our wounds, asking for healing, asking for strength to show our children a better way. And though it may take months or years, and though our child may live forever with some of the scars from his early years, sometimes picking up his defenses again like an old habit, one day, eventually, we’ll see: All that time, you weren’t working to tear down their defenses. You were toiling and working and sacrificing in the belief that one day, they would peek out the windows. One day, they would open their fortress gate and receive a little more of the love you’re sending their way (and this is when you turn up the love to 11). And the prayer is that after a long, protracted battle, them attacking, you receiving and bleeding and sacrificing for them (and guarding against the bitterness that would have you build your own defenses), one day they would call off the attack, drop their weapons and walk out their fortress door. The prayer is that they would finally leave their protection behind, that they would run into your arms at last. Over time I’ve learned that my own struggles with vulnerability, with the ability to attach, has to do with my own upbringing, the attachment styles of my parents, and the world-shattering experience of losing my dad when I was just 21, to name a few. When I entered into the world of adoption and thought myself the rescuer, I know God looked at me with such love and compassion, knowing what was ahead. I had so, so much to learn. I’m not sure if I could have been on my own heart-healing journey in quite the same way without my two little Ugandan loves to guide me. And then I can guide them. And then they can show me the way. We take turns leading each other to the foot of the throne of Jesus, the ultimate example of unconditional, complete, open love, love, love. Remember, just like your own journey to Jesus, your child’s path will rarely go from point A to B to C. She will test the waters, then retreat and fire away again. She’ll peek out from her defenses and then, just when you feel like you’re turning a corner, she’ll launch a bigger attack than you’ve seen before. But taking the long view, you’ll see progress, with God’s help. When we feel like building a wall, Jesus calls us to love with an open heart. When we feel like closing off or fighting back, Jesus calls us to open our arms to accept what comes. When we’re so tired, Jesus tells us to look to our right and find him holding our hand, taking the blows alongside us, and we can draw strength from him. When we feel like it will never end or we’re not sure we can last much longer, Jesus shows us the way to vulnerability and softening our hearts, so we can show our child the same path. Eventually, our child will find his way into our arms, and then we’ll be able to show him how we found our way into Jesus’ arms. Kim Van Brunt is an adoptive mama and writer, holding up her broken pieces to the Light where everything can be made beautiful. 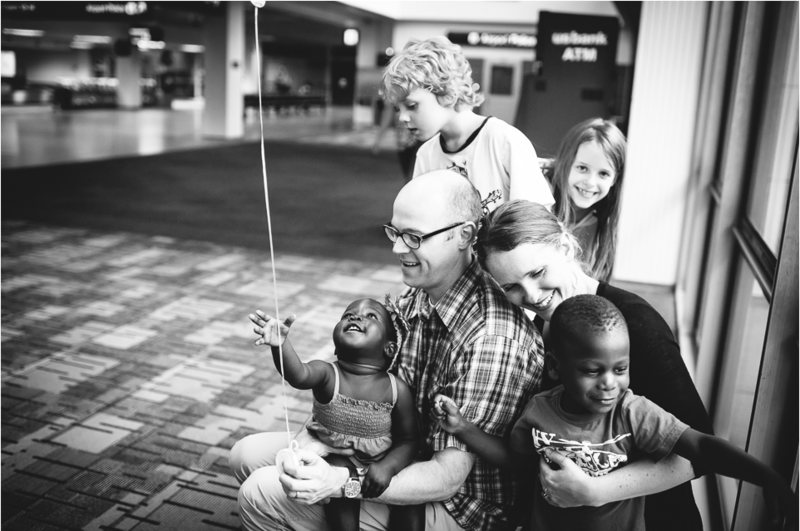 She has four littles at home, including two born in Uganda, and is working on a book or two. This post includes excerpts from her upcoming book for adoptive parents, titled “Wounded Healer.” For more, follow her blog on Facebook, and on Twitter @kimvanbrunt. This entry was posted in november 2014 and tagged adoption, adoptive parent, carissa woodwyk, guest blogger, human heart, kim vanbrunt, national adoption month, Story, we need one another by Carissa Woodwyk. Bookmark the permalink.